The Rotary Club of Drogheda Meals On Wheels service has been in operation now for almost 43 years. It was introduced in 1969 and was the first of it’s kind in the country. Since the establishment of this much-needed social service, Drogheda Rotary Club prepares and delivers over 55 hot meals, three times a week (totalling over 165 meals) to the elderly and incapacitated in the local community.. 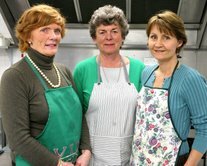 The meals are prepared by a voluntary team of 50 ladies, who are connected with Drogheda Rotary Women’s Inner Wheel Club, and work under the supervision of Adri Berney. The members of Drogheda Rotary Club (in excess of 50), deliver the meals and this service is co ordinated by Rotarian, Ger de Loughry. The Rotary Club of Drogheda provides a Meals On Wheels service on Christmas Day. All of the meals are prepared in the St Vincent de Paul premises in Trinity Street, Drogheda. The recipient list is reviewed regularly with the input and assistance of the Public Health Nurses attached to the HSE, in Drogheda. The Rotary Club of Drogheda Meals On Wheels project is mainly financed through the Club’s fund raising activities,in particular our Annual Golf Classic, Private Donations and a Subvention from the HSE.